Sitting on a mat in the middle of the Negev desert, the smell of shisha smoke spices the night air. A bonfire behind me sends shadows scurrying out across the sand like scarab beetles, as I sip mint tea under an acacia tree. It’s a scene which, if not for my University of Massachusetts sweatshirt and the occasional ring of a cell phone, could make me forget that I’m just an American sightseer at a tourist trap in Israel. Just a few hours earlier my Jewish tour group had been in a concrete-and-cinderblock absorption center for Ethiopian immigrants in inner-city Jerusalem. The next morning we would be headed to a Mediterranean oasis, full of hot springs, waterfalls, and tropical plants. The contrast between these locations seems strikingly bizarre—but that is the epitome of Israel. It’s a land of great contradictions; where palm trees grow next to deserts, where ancient artifacts are discovered alongside the newest technologies, and where the holiest cities are also the most conflicted. Visiting Israel first crossed my mind when my friend Emily told me about Birthright Israel, an organization that sends young Jews ages 18 to 26 on educational 10-day trips to Israel for free—everything, including airfare, hotels, and meals are provided for. The purpose of the program is to help establish a stronger connection between Jewish communities and the Jewish state. After reading more about the organization, I decided to sign up for a summer 2008 trip. Since 2008 is Israel’s 60th anniversary, Birthright planned to break record numbers by sending 40,000 young Jews to visit the country. Emily went on her Birthright trip in May, and returned back to the U.S. ecstatic. “Israel is life-changing,” she told me. I anxiously awaited my own trip, but I was also uncertain. How could a country change your life? My tour group sat on a rug on the floor of the Gallery of Mystical Art, listening as artist Avraham Loewenthal, formerly Robert Loewenthal, spoke about Kabbala. He wore a large yalmulke with a geometric design, a gray sweatshirt, and a thick, dark beard. Beautiful paintings covered the walls of his bright gallery located in Tzfat, the capitol of Jewish mysticism. He was a world away from Michigan, where he grew up and attended college as a secular Jew named Robert. “I was never interested in Judaism until I started studying Jewish mysticism. I came to visit Israel after college, met my teacher, and decided to make aliya [immigrate],” he said, in a voice that would be more fitting for a California surfer on acid than a religious man. When he talked about Judaism, everything was “awesome!” or “totally mind-blowing!” His eyes crinkled when he smiled, and his excitement was so genuine that it was hard not to like him. He explained his decision to change his name. “Names are so important; they tell so much about who you are.” He urged us to go out and get our names analyzed, or to change our names if they didn’t suit us. It was an interesting conversation, but I wasn’t completely convinced. 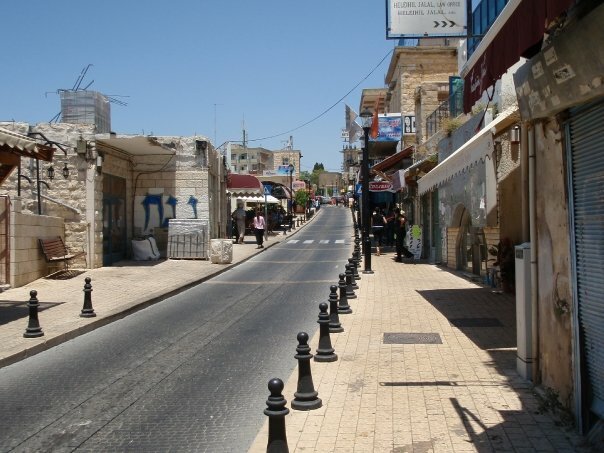 Later that day, while shopping for trinkets in Tzfat’s marketplace, I entered a small, unusual boutique. The shop-owner, an old religious man with a long, white beard, sat on a chair in a small room in the back of the store. He knew very little English, but motioned for me to come closer to him. “What is your name?” he asked me immediately. I told him, and watched in astonishment as he pulled out a large, old book and began translating the meaning of my name. Strange things happen in Israel, odd coincidences. For some people, they are brushed off or ignored; for others, like Avraham Loewenthal, they are life-changing. 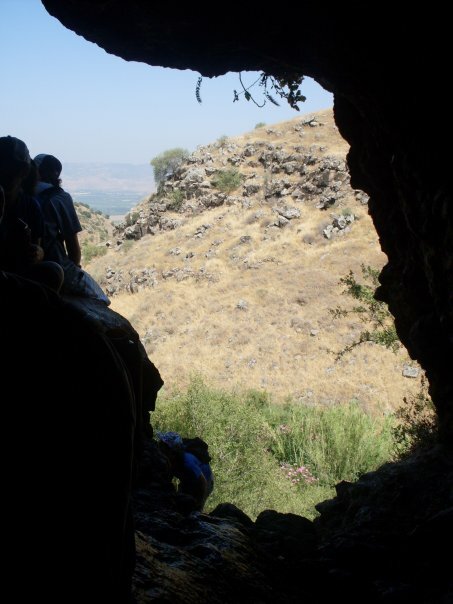 The second day of the trip, my group traveled to the cliffs and plateaus that make up the Golan Heights, an area which belonged to Syria until 1967. Right now, the Golan Heights is one of Israel’s bargaining chips for peace, and may be given back to Syria in the coming months. From the top of the cliffs it’s easy to see the strategic view that Syrian snipers’ used to enjoy of Israeli farms in the valley. Harder to describe is the sweet smell of the Golan’s flowering trees and the feeling of its stones beneath our hands as we climbed. Looking out over the Golan’s vast beauty is a reminder that something so ancient and enormous can also be so fleeting and delicate. We hiked the Golan Heights in order to understand its strategic military value, but we left subdued, frustrated, and pessimistic about its future as an Israeli landmark. Our tour guide at the army border post was a rugged military police chief with a dry sense of humor and a bit of a grudge against the Lebanese. His stories were ripe with profanity, and he constantly apologized “to the ladies” in his southern Atlanta drawl. The first thing he did was bark at us to put away our cameras, because if photographs of his base ended up online they could put him in danger. “Getting me killed only helps my ex-wife. And helping my ex-wife is like helping Hezbollah—completely unacceptable,” he told us. A U.S. native, he chose to make aliya to Israel and join the military. Wherever we went in Israel my group seemed to run into people with the same passion for their country and the same sarcastic humor. “Our terrorist neighbors in Syria are so kind,” said one smiling Israeli tour guide at a Northern donkey ranch. In a country whose future is so tenuous and unpredictable, humor isn’t just a coping mechanism, it’s a necessity. On a nighttime cruise across the Kinneret, with the lights of the holy city of Tiberias coloring the dark waters, I experienced something brand new. I was on a boat full of young American Jews singing “Od Yavo Shalom Aleinu.” It was a song that many of us had never heard before the trip, but we would now remember for the rest of our lives. 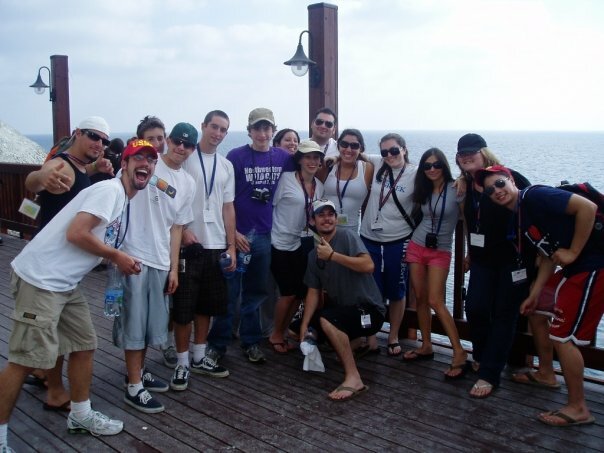 The best part of Birthright, for many people, was meeting Jewish friends. Most of us come from towns where Jews are the minority, and it was unbelievable to be in a place where virtually everyone was Jewish. It was easy to make friends on the trip. Most of us are in our late teens or early twenties and we barhopped in Tel Aviv, went to night clubs in Jerusalem, and did our fair share of drinking in the smaller cities. But there was also a great deal of intellectual curiosity which grew as we delved deeper into the heart of Israel. In Tel Aviv a group of us stayed up until dawn, sitting on a curb outside of our hotel, smoking Israeli cigarettes and debating politics and religion. At the Bedouin tents we argued about Israel’s future. We never came up with any conclusions, but we had some meaningful discussions with friends who won’t be forgotten. Were our experiences life-changing? Probably not. But we all left the trip with something more than we expected. Visiting Yad Vashem, seeing the atrocities committed during the Holocaust, and hearing speeches from survivors was a reminder of how necessary it is for Jews to have our own soil and safe haven. 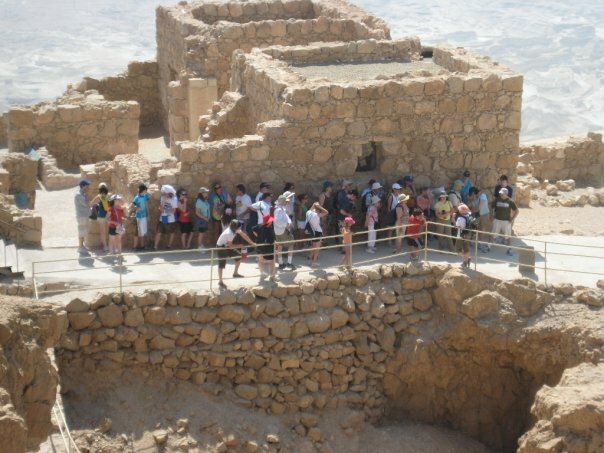 A few days after seeing Yad Vashem, we hiked Masada, a tan, sandy plateau topped with ancient ruins that towers over the Dead Sea. It was the last stronghold for the 960 Jewish Zealots who defended their land against the Roman army nearly 1,000 years ago. Rather than convert and become slaves to the Romans, all 960 Zealots committed suicide on Masada. They died wondering if Judaism would die out with them, but hoping that their courage would inspire future generations. The victims of the Holocaust also died unsure that Judaism would continue. After the Holocaust ended, many of the survivors came to Israel, some to help with excavations at Masada. Behold O my people, I will open your graves, and cause you to come up out of your graves, and bring you into the land of Israel. The last day of our trip was spent in Jerusalem, where we shopped for souvenirs in the Jewish Quarter, a tunnel dotted with gift shops, t-shirt stands, and jewelry stores. Shopping in Israel is always an experience, because nothing has prices on it. The Israelis enjoy bargaining with tourists, and most of the shops sell the same exact items at bafflingly different prices. Leaving the Jewish Quarter to walk to a coffee shop for lunch, we noticed lines of IDF soldiers standing solemnly in the walkways. I knew something was wrong as soon as our Rabbi gathered my group into a stairwell and said he needed to make an announcement. There had been a terrorist attack on Jaffa Street, a few minutes away from where we had been shopping. A Palestinian man had driven a large bulldozer into oncoming traffic, toppling a bus and crushing several cars, killing three people and injuring others. My stomach dropped to my feet. It was a beautiful day outside, and the victims had probably wanted to do some shopping and enjoy the weather. Next to me, our young tour guide sighed. “Now they’ll debate over whether to destroy the terrorist’s house in Jerusalem,” she said, weary from hundreds of previous disputes. We walked over to the Western Wall, where there were clusters of Jewish women praying for the victims and their families. The women may never have met the victims; it didn’t matter. There is a solidarity among Israelis that goes beyond religion and nationality. Looking at the people praying around me, I realized that in the eyes of the terrorists, all of us were the enemy. It didn’t matter if we were Israeli or American, soldiers or civilians, religious or secular; all that the terrorists saw was Jew. Since Birthright began in 2000, over 160,000 young Jews have returned “home” to Israel. Some of them will stay for the rest of their lives; some of them will leave and never go back. However, everyone who participates in Birthright will have an unforgettable and once-in-a-lifetime experience. The trips are scheduled in the winter, spring, and summer. To learn more about registration, go to: www.birthrightisrael.com, or www.mayanotisrael.com.